Photos of this extraordinary Regal Moth caterpillar, Citheronia regalis, were sent in by Jonathan Pace. 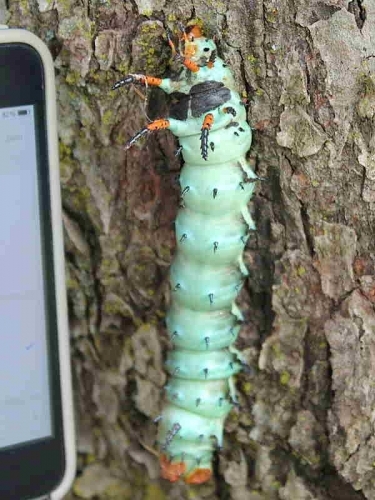 He recorded the caterpillar also known as the Hickory Horned Devil on a tree trunk in a cemetery in North Brunswick, New Jersey, USA. The huge size of the caterpillar is well illustrated by being next to his iphone. At 14cms it is the longest moth caterpillar in North America. At first glance, and being unfamiliar with this species, I thought the caterpillar was lying on its back with its true legs facing upwards. Many thanks go to Jonathan for use of his images and his identification enquiry.